My cooking mojo has been a bit lacking lately. I’ve been trying out lots of weird recipes that I’ve never tried before, and many of them have been disappointing. On Thursday I really felt like a good meal that everyone would like. I made a trip to Harvest in Fairfield (previously Organic Gertrude) where I picked up some lovely vegies and, spontaneously because I just couldn’t resist it, a takeaway soba salad for my lunch. Organic Gertrude was closed for renovations recently, and they’ve re-opened with a much better and brighter layout. The cafe has taken over the front of the shop, and the grocery section has moved to the back. It’s much more sensible and the whole place looks much brighter and more welcoming. It’s my favourite place for buying organic fruit and vegies, but I’d rarely eaten from the cafe before. I’m sure I’ll be going back. For dinner, I’d decided on BIG burgers with chips and salad, because I knew that would be popular with the family who have bravely soldiered through some crappy food this week. Then, when I got home, I found a message from B (my husband) to say that his job was just made permanent. That’s pretty exciting for us, because after being made redundant late last year, he’s been employed, but not feeling very secure. Time for a celebration! Burgers tonight (well, something edible would be a bit of a celebration this week)…and maybe dinner out somewhere more exciting later on. 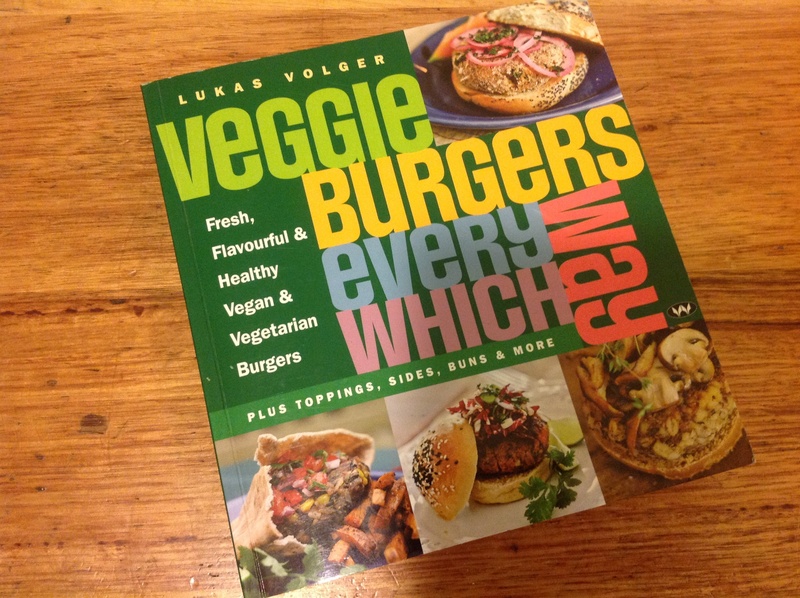 My favourite burger cookbook, Veggie burgers every which way by Lukas Volger, doesn’t have heaps of vegan recipes, so I flicked through it for inspiration, then made up my own burger recipe. I did, however, follow the book’s recipe for potato chips and sweet potato chips – and they were REALLY good. 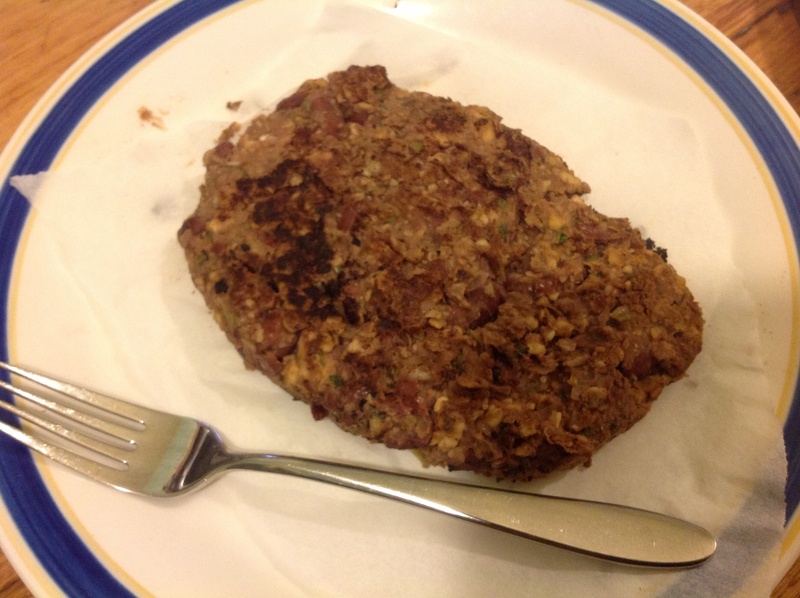 Not many vegan burgers, but great for inspiration – and chips! This made about 7 BIG burgers, so there were plenty for leftovers (always a good thing with my son around). In the food processor, whizz the onion and garlic till very finely chopped, then fry gently in about 2 teaspoons of olive oil. While that’s starting to cook, put the celery, capsicum, zucchini and herbs in the food processor and whizz till fairly fine, then add to the frying pan and cooking stirring around every few minutes. While that’s frying and softening up, pulse the walnuts in the food processor until crumbly. Tip into a large mixing bowl. Pulse 1/2 the tin of red kidney beans until they are broken up, but not pureed (a bit like the walnuts). Add to the bowl. When the vegies in the frying pan are all nice and softened, tip the lot into the big bowl with all the other ingredients – remaining kidney beans, salt, paprika, almond paste, quick oats, quinoa flakes and refried beans. Mix it all up well. The best part about vegan food is that you can taste it before it’s all cooked, and get your flavourings right, because there’s no raw egg or meat. I made big burgers, and I have a smallish cast iron pan, so I got out the big non-stick pan and had two frying pans going at once, like a tiny production line. This is a weird (& blurry) picture. I was trying to show that the burgers were really big, but the plate is very large, so you can’t tell! This burger was a bit bigger than my hand and about 1.5 cm thick. I fried them until browned and heated through. If your burgers are huge like mine, be VERY careful when you turn them, because they’ll break up on you. A couple of bits broke off, but I just smooshed them back into the side of the burger and they held together like magic. These big burgers took about 4–5 minutes each side to cook and heat through, but with normal-sized burgers, you’d need to check them frequently because they’d need less time. I served my burgers in wholemeal buns with beetroot (because I’m Australian). 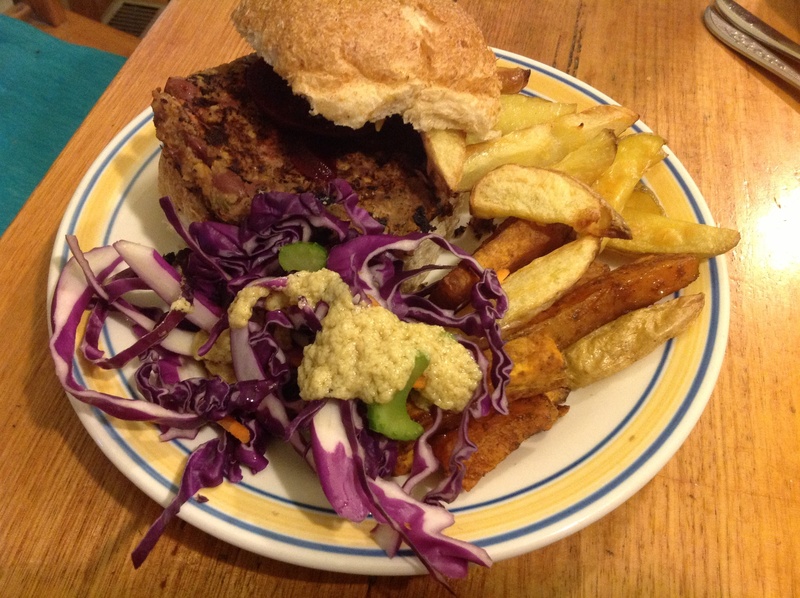 On the side, I served the oven potato fries and sweet potato fries (from the veggie burger cookbook) and a salad made from shredded red cabbage, spring onions, carrots and celery, with my favourite salad dressing from VeganEasy. Yes, it’s a crappy picture, but it was a good dinner. That dressing looks a bit lumpy – but it tasted great! Now, I’d better get off this computer, because I need to go and start making my sign for the March In March this Sunday. It’s time to send our Prime Minister a message about his treatment of refugees…and live export…and gay marriage…and Medicare…and national parks…and so many other issues that make me very cross, before he takes away our right to protest! If you haven’t seen this video, watch Tony Abbott as he’s asked a few simple questions by some year 9 students. Take particular delight in the moment he asks for some “bloke’s questions”. What an embarrassment. ← Fry’s chocolate bars. They’re vegan! I must be hungry, but I’m totally craving a veggie burger about now! Thanks. We had a great day at the march and the rain held off till long after we’d finished walking. I remember you mentioning your family don’t like burgers – or was it meatballs? – Same thing anyway. My family always love them, thankfully, because I do too. Hooray, great news Linda. Those burgers are full of good stuff. I think I’ll have to give them a go but not in buns, just with chips and salad for us. 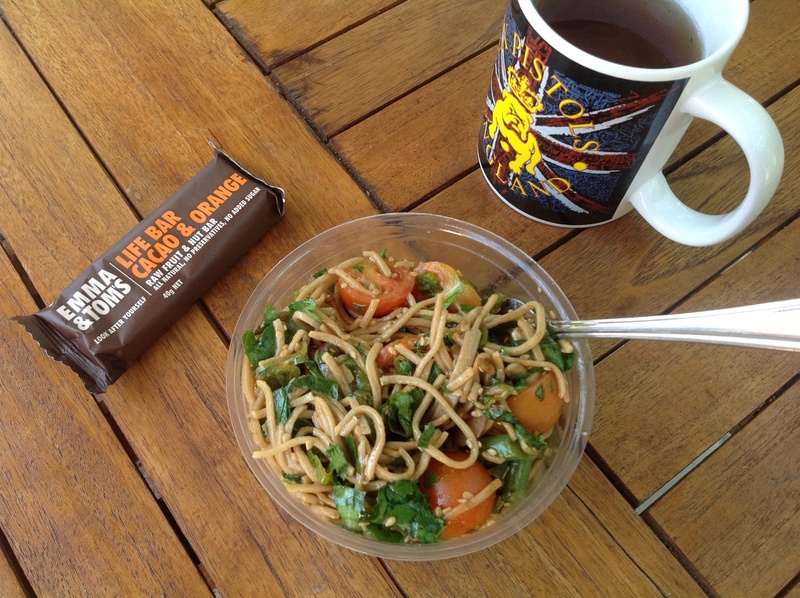 That soba salad looks so terrific, I can’t even make my way down to the burgers! Good on you for being active; we can all stand to be just a little bit more to ensure our voices are heard.